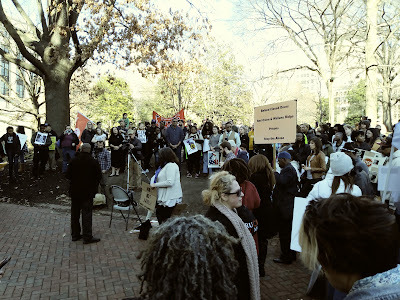 RICHMOND, VA -- In the largest show of support for Virginia prisoners in memory, more than 300 people turned out Jan. 20 for the Virginia Rally for Prison Reform on Richmond’s Capitol Square. They came by chartered buses and carpools from Blacksburg and Roanoke, Prince William County and Fredericksburg, Suffolk and Hampton Roads, as well as from the Richmond area. One of the largest contingents was from the NAACP chapter at Norfolk State University. Many were former prisoners or relatives of prisoners. Some represented prisoner advocacy groups. Others were individuals drawn to the event by the crying need for reform in the Virginia prison system. Several newly seated state legislators were in attendance. One especially unique feature was that the rally was initiated by a prisoner organization, Virginia Prisoner of Conscience (VAPOC), whose members spread the word among their relatives and friends on the outside. Logistics were handled by the Coalition for Justice of Blacksburg and the Richmond-based Virginia Defenders for Freedom, Justice & Equality. 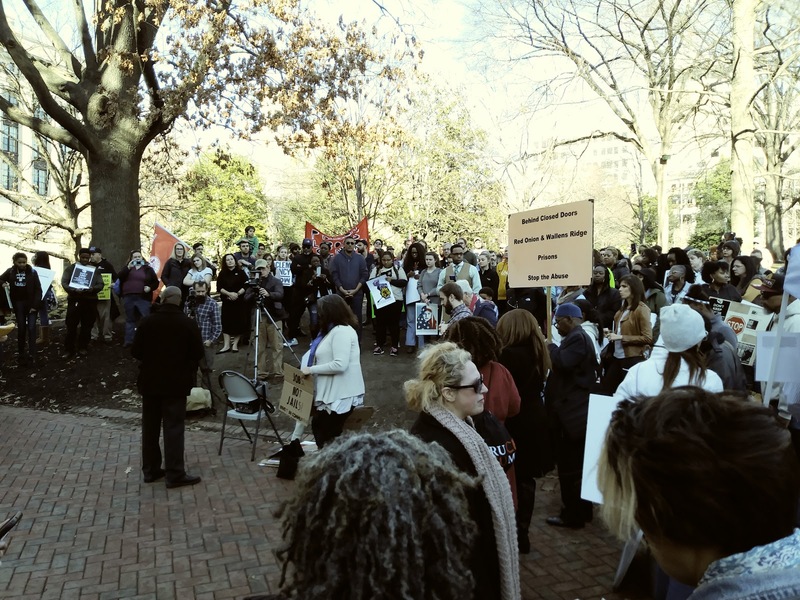 Co-chaired by Margaret Breslau of the Coalition for Justice and Joseph Rogers of the Virginia Defenders, the rally began with statements from four incarcerated VAPOC members. Statements by some 20 other prisoners were printed, laminated and hung on a literature tent next to the speakers, to be read by rally participants. More than 100 people left their contact information on sign-up sheets at the literature table. Rally permits for Capitol Square are limited to one hour, so half that time was reserved for former prisoners and people with incarcerated loved ones. A long line formed next to the speakers’ area as dozens waited to share their stories. The all-volunteer effort featured speakers from a wide range of organizations, including Resource Information Help for the Disadvantaged (RIHD), the Angela Davis' Black Girl Coalition, Bridging the Gap, Virginia Raise Up / Fight for $15 and the ACLU of Virginia, as well as Janet “Queen Nzinga” Taylor, a longtime supporter of Rastafarian prisoners held for nearly 15 years in solitary confinement for refusing to cut their hair, and Henrietta Trotter, representing the family of Jermaine Doss, a wrongfully incarcerated prisoner from Norfolk whose request for a governor’s pardon submitted nearly four years ago has yet to be answered. Rally endorsers included A Firm Foundation, Inc.; Abu Unity Foundation; ACLU of Virginia; Richmond chapters of the Democratic Socialists of America and Industrial Workers of the World; First Alliance Consulting Group LLC; Interfaith Action for Human Rights of Washington, D.C.; Leaders of the New South; New Virginia Majority; RIHD; Together We Will RVA; Virginia Prisons Accountability Committee (VAPAC); and Young Virginia Voters Center. The event was videoed by local videographers Silver Persinger (https://vimeo.com/251993742) and David Martin and live-streamed on the Defenders’ Facebook page (https://www.facebook.com/ana.edwards/videos/10156060919023501/). Participants then marched out onto the sidewalks surrounding the square chanting “Money for Jobs and Education, not for Mass Incarceration!” and “What do we want? JUSTICE! When do we want it? NOW!” The chants got especially loud as the march passed the Governor’s Mansion, where newly inaugurated Gov. Ralph Northam has taken up residence. Later that afternoon, more than two dozen rally participants met at Wesley Memorial United Methodist Church in the city’s East End to build on the day’s success. The collective decision was to build a statewide network of prisoners, ex-prisoners, prisoner families, advocates and supporters to facilitate communication, publicize prison reform bills, share resources, support each others’ struggles and keep these issues in the public consciousness. For more information and to get involved, contact: justicebburg@gmail.com.